When the EPA promulgated rules on wood stove emissions, they first defined a wood stove under a set of very particular characteristics including air-to-fuel ratio, firebox volume, burn rate and maximum weight (Fig. 35). 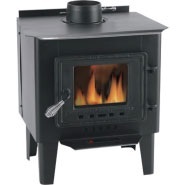 Since then, some stove companies have sought to escape the EPA emissions and efficiency standards by designing their stoves in such a way that the appliance does not meet one of the criteria that defines a wood stove. Most consumers are not aware that tens of thousands of new polluting stoves are still sold in the US every year because they fall outside the EPA’s purview. Numerous local jurisdictions do not allow their installation and three states do not allow the installation of new or old stoves that are not certified by the EPA: Washington, Oregon (OR’s law also applies to sale) and California. In addition, the state of Colorado does not allow the sale or installation of new, uncertified stoves, but does allow the sale and installation of second-hand uncertified stoves. The EPA is in the process of requiring all wood stoves to meet emission standards so this class of stoves only has a few more years to be considered exempt from emission standards. States and jurisdictions may still want to ban their sale and installation, as Oregon has implemented since March 2011 to avoid more installations before the new EPA standards for single burn rates stoves come into effect, which will likely be in 2015. Oregon and Washington State may continue to adopt stricter standards than even the EPA’s NSPS. 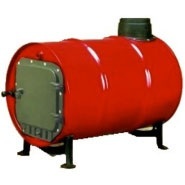 The primary policy consideration for exempt stoves is for jurisdictions conducting changeout programs. If those jurisdictions continue to allow the installation of these stoves (either new or used), while putting resources into changing out older polluting stoves, then the former policy will likely undermine the latter. Incentive programs should not support these inefficient, highly polluting designs and should specify that the only EPA exempt appliances eligible for the incentive are masonry or pellet stoves that meet certain specifications. Some of these unregulated stoves may look deceptively like more efficient stove designs. Other unregulated stoves have designs more obvious in their lack of efficiency and emission technology.